Click myCareer under the Quick Links menu on the right hand side of the page. 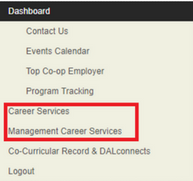 Upon entering myCareer, you will see a menu in green along the left hand side of the screen; the two menu options that most students find confusing are: Career Services and Management Career Services. As a Dalhousie student, you have access to the services and resources provided by Dalhousie’s Bissett Student Success Centre (located in the SUB) which can be found under the Career Services tab. This includes job postings for part time, full time and volunteer positions. As a student in the Faculty of Management, you also have access to the exclusive and industry-specific services and resources provided by Management Career Services. Including Co-op/Internship job postings, exclusive events and information sessions, as well as the ability to book a meeting with a Career & Recruitment Specialist. Students should be in the habit of logging into myCareer on a daily basis to see new opportunities as they become available. The default view when you login is the Dashboard tab. Within the Dashboard tab, you can toggle between the Overview, which highlights important messages for users and a box on the right displaying Upcoming Events/Workshops, and My Account, which lists your account info and allows you to make edits to certain fields. The Documents tab allows you to view any files you have uploaded to myCareer, such as cover letters, resumes, and application packages. To view your application history and the status of individual applications you’ve submitted, click on the Posting/Applications tab. Within the Interviews tab, you can toggle between Interviews and Mock Interviews. Both areas will detail interviews you have been selected for with respect to current or past applications. When employers want to use myCareer as a resource to schedule interviews with prospective Co-op students, you will be notified by email to login to the myCareer site and confirm a timeslot for your upcoming interview. Under the Appointments tab, students can view any upcoming or past appointments that have already been booked or cancelled. If you have registered for one of our upcoming events, (such as a workshop, information session or recruiting event) the time and place of the event will be listed in this section. To retrieve a detailed description (date, time, location) of the event you have registered for, or to cancel your registration, simply click on the event name.